Knowing which vegetables belong in the crisper and keeping the temperature of the fridge between 35 and 38 degrees is a good start. Use one crisper for fruits and the other for vegetables. The exceptions to this are onions, sweet potatoes, hard rind squashes, eggplant and rutabagas. Tomatoes and avocados can be placed in the crisper once they are ripe. Crispers slow the dehydration of fresh vegetables, however, too much moisture can destroy lettuces and spinach. Lettuce can be washed, dried and wrapped in paper towels to keep it fresh and easy to use in salads and on sandwiches. If you have are lucky enough to have an over abundance of vegetables try making soups or sauces to keep in the freezer. The internet is a great source for new recipes. Incorporating fruits and vegetables into your diet will help prevent hypertension, heart disease, diabetes, certain cancers and give you a longer and healthier life. Toss fennel, orange slices, lemon slices, chile, and 4 dill springs in a shallow 3 quart baking dish; season with kosher salt and pepper. 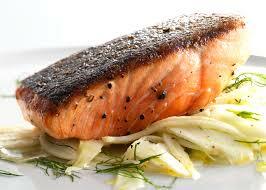 Season salmon with kosher salt and place on top of fennel mixture. Pour oil over. Roast until salmon is just cooked through (the tip of a knife will slide through easily and flesh will be slightly opaque). 30-40 minutes for medium rare. Transfer salmon to a platter, breaking it into large pieces as you go. Spoon fennel mixture and oil from baking dish over; discard dill sprigs. Season with sea salt and pepper and top with fresh dill springs.